Android 4.0+ smartphones or IOS smart phone.Download Bluetooth notify APP software.And install the software in the phone. IOS Functionality:Baro/Pedo/Alti Meter,Calendar,Call sync,Music.Android Functionality:Support all function mentiona on description. 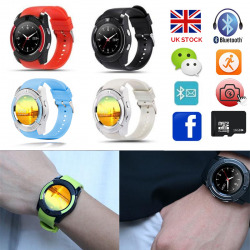 Product include:1 x V8 Smartwatch,1 x USB Cable,1 x User Manual,1 x Retail Box. Android smartwatch installed APP can support information push,IOS can not install APP.